Canadian Brig.-Gen. Daniel Menard (left), commander of coalition forces in Kandahar province, walks with U.S. Capt. Tom Lamb, commander of 1-12’s D Company at a strongpoint outside the town of Senjaray, Afghanistan, on Thursday, Dec. 10, 2009. 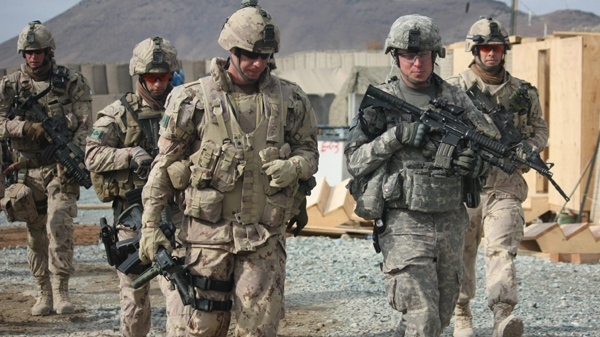 Canada’s role in the Afghanistan War began in late 2001. Canada sent its first element of Canadian soldiers secretly in October 2001 from Joint Task Force 2, and the first contingents of regular Canadian troops arrived in Afghanistan in January–February 2002. Canada took on a larger role starting in 2006 after the Canadian troops were redeployed to Kandahar province. There were 2,500 Canadian Forces (CF) personnel in Afghanistan and 1,200 comprised the combat battle group. At the 2012 NATO Summit in Chicago, Prime Minister Stephen Harper announced that an undisclosed number of Canadian soldiers would remain in the country to help train and mentor the Afghan National Army until 12 March 2014 (though Canadian troops ended their combat role there in 2011). Infantrymen of The Royal Hamilton Light Infantry in General Motors C15TA armoured trucks, Krabbendijke, Netherlands, 27 October 1944.